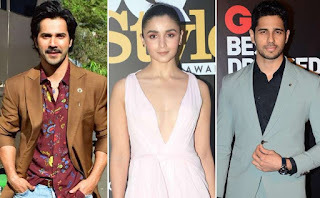 6 years back, Karan Johar introduced three young talents to the Hindi Film Industry – Varun Dhawan, Alia Bhatt and Sidharth Malhotra. His directorial, Student of The Year was a dream launch for the 3 actors, as the film did not just open well but also proved to be an extremely successful venture at the Box-Office. While it proved to be an ideal launch pad, it was up-to Karan Johar’s 3 Students to carve their careers from thereon with their film choices. So here’s a look at the journey of these three actors and how their career shaped up after the release of this film in 2012. Talking about Varun Dhawan first, he is undoubtedly one of the most bankable stars of the Hindi film industry in today’s time. In the last 6 years, the star acted in 11 films belonging to diverse genres and none of them proved to be an unsuccessful venture. Varun didn’t just explore the commercial space with films like Main Tera Hero, Humpty Sharma Ki Dulhania, Dishoom, ABCD 2, Dilwale, Badrinath Ki Dulhania and Judwaa 2, but also tried his hands at the not so commercial genre by taking up films likeBadlapur, October and Sui Dhaaga. The trade today considers Varun Dhawan the most consistent actors among the young generation as his films have often ensured respectable theatrical outcome. In the last 6 years, Varun Dhawan proved his worth – both as a star as well as an actor and is achieved an amazing feat of acting in 11 films consecutive without a flop and is now eyeing at Rajesh Khanna’s record of 15 films without a flop. All that Varun’s filmography is devoid of so far is a massive blockbuster, however we are hopeful that the same shall happen in a couple of year. Coming to Alia Bhatt, the actress underwent a 360 degree transformation post Student of The Year. From being labelled a non-actor in 2012, Alia Bhatt in today’s time is termed as one of the best female actors in today’s time. The acting aspect aside, Alia Bhatt is currently second to Deepika Padukone when it comes to the star-power of female actors in India, and given her strike rate, she is soon expected to emerge the biggest female star of the film industry. Her successful films includeHumpty Sharma Ki Dulhaniya, Highway, 2 States, Udta Punjab, Kapoor And Sons, Dear Zindagi, Badrinath Ki Dulhania and Raaziwhereas Shandaar is the only outright flop that she has acted in. With multiple releases in 2019, we expect Alia Bhatt to reach the pinnacle of success by the end of t his decade. Next articleThe Nun Movie Review: A Good Looking Not-So-Scary Flick!